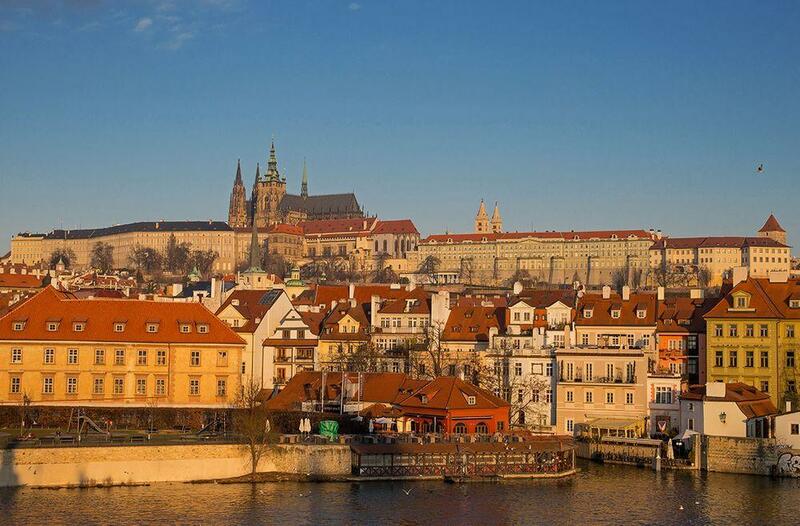 The gorgeous Prague has it all… even one of the greatest Gothic cathedrals in the world! 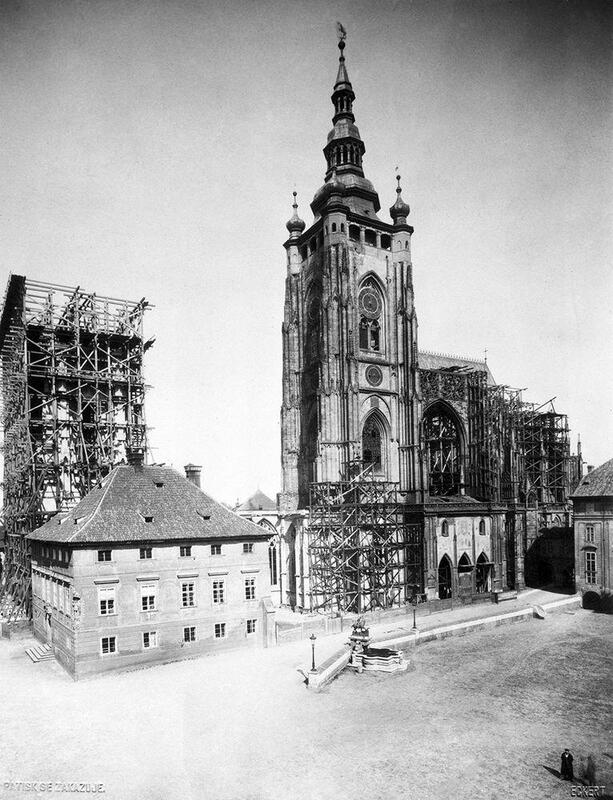 Construction of St. Vitus Cathedral lasted for centuries and, most likely, many generations dreamed to see it completed. We have this privilege now. Current cathedral is the third church in this site. First church – a rotunda in early Romanesque style – was built here in the times of Wenceslaus I, in 930. In these times majority of people in the present day Czechia – also in Prague – were Pagans. Their conversion continued for several centuries until the 11th century and even after then. Huge importance in the conversion of Pagans was attributed to tangible items – relics. Also the church in Prague was built for a valuable relic – the arm of Saint Vitus which was obtained from Emperor Henry I.
St. Vitus was a man from Sicily who was one of the Christians persecuted and killed by Romans – he died in 303 AD. Little is known about the real person but there have been created many legends about St.Vitus. Cult of St.Vitus evolved in parts of the present day Germany and Czechia and later also in other parts of Europe. In 1060 there was founded the bishopric of Prague and then, in the times of prince Spytihněv II was built larger basilica, also in Romanesque style. 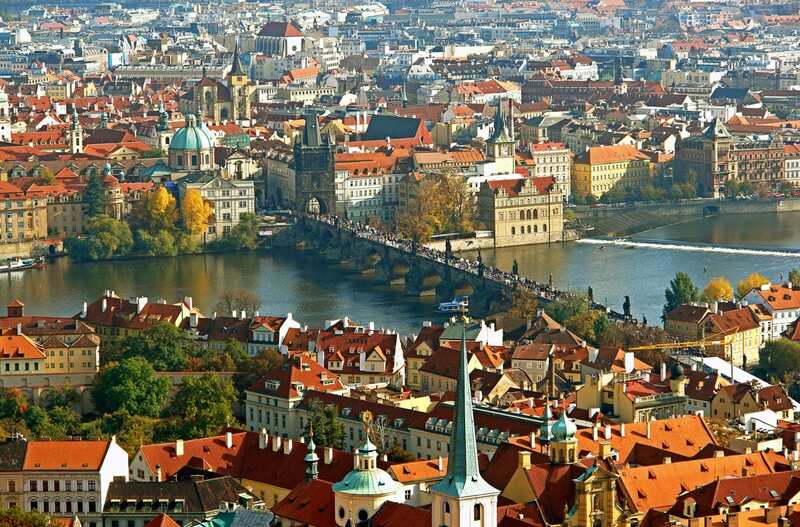 In the Middle Ages Prague was one of the leading cultural centres in this part of Europe. It was rich, influential and attractive urban centre with high ambitions. When Prague bishopric was raised to the status of archbishopric, it was decided that city needs a new royal church of unseen size and quality. Thus in the 21st November 1344 the works were started and King John of Bohemia laid the cornerstone. Just like in the case of other great Gothic cathedrals, Cathedral of St. Vitus was built over a long time and had several chief engineers – architects. First architect was Matthias of Arras. He designed the overall structure – it was modelled after the great French Gothic cathedrals. After the death of Matthias of Arras in 1352 work was continued by a young talent – 23 years old Peter Parler. He had the courage to disregard many ideas of his great predecessor and added such important innovation of Gothic style as the intricate and sturdy net vaults. Parler started (or was one of the first) one of the most impressive features of Gothic style – sophisticated and beautiful vaulting. 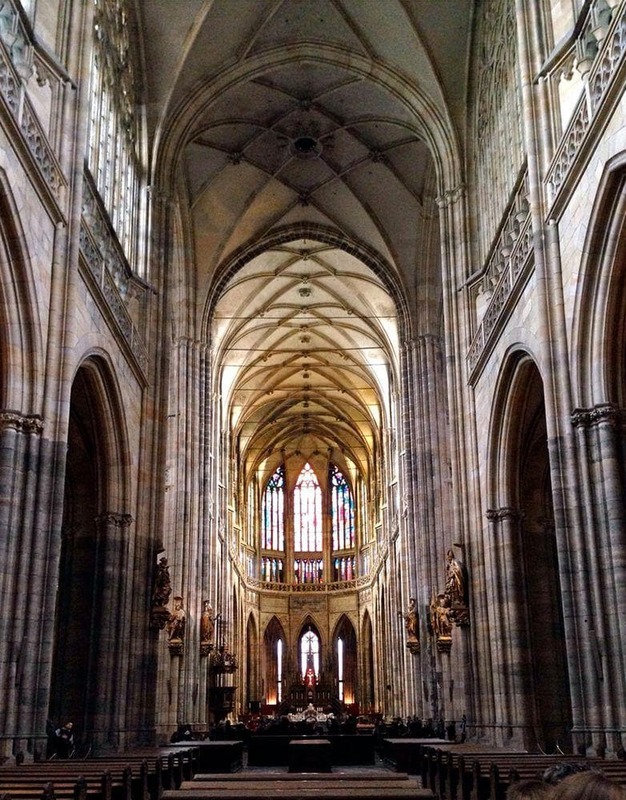 Parler’s design and engineering solutions to a great extent shaped St. Vitus Cathedral. Good artisans are much needed: Parler was employed in many other projects and the works in cathedral proceeded quite slowly. When Peter Parler died in 1399, there was still a lot to build. Work was continued by his sons Wenzel and Johannes, and then, in 1418 – Master Petrilk. In 1420 started the devastating Hussite War: the church at this time was half-finished. Immense values were lost during this war and in later times. 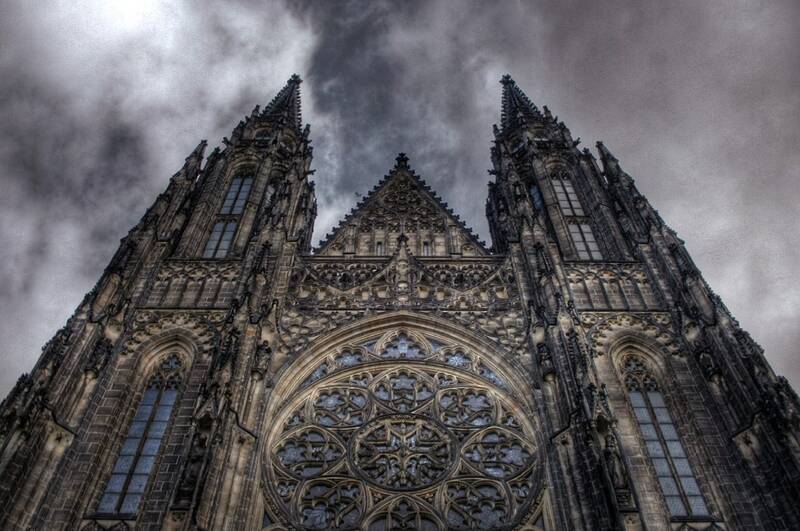 St. Vitus Cathedral stood unfinished for long centuries until the middle of the 19th century when the aesthetics of the Gothic style were trendy again. In 1861 works started and lasted well into the 20th century. In 1929 this giant work of art and wonder of engineering and architecture was completed. Works were done with great skill and attention to the original plans. St. Vitus Cathedral is the largest and most important church in the Czechia, a seat of the Archbishop of Prague. It is a part of the Prague Castle – cathedral was originally planned as the main, royal shrine – a place for coronation, a family crypt and a place for storage of royal treasures and, of course, the place for storing religious relics, including the remnants of St.Vitus. Cathedral up to this day serves as a repository of huge amount of valuable items and relics. Here are located tombs of many Bohemian kings and Holy Roman Emperors. 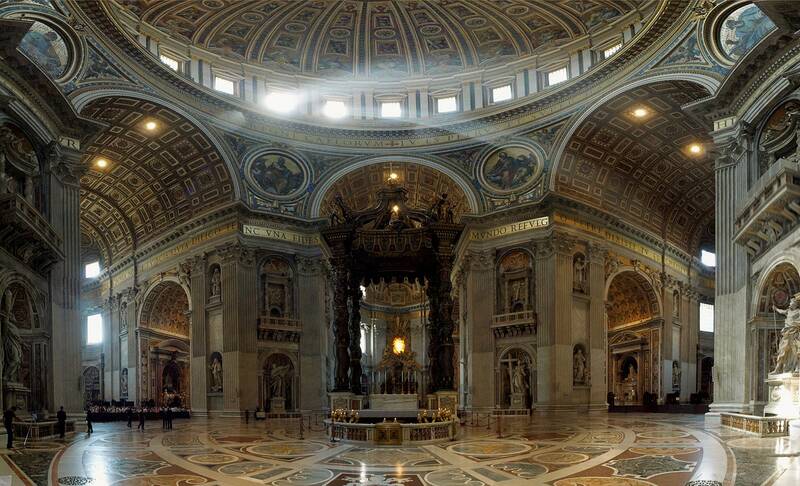 The church is enormous: 124 m long and 60 m wide. It has a massive central tower which is 96.5 m tall and two front towers, each 82 m tall. Height of the arch inside the church is 33.2 m.
One of the most impressive parts in the church is St. Wenceslas Chapel which contains relics of this saint. This part of the church is built in Gothic style with ribbed vaults. Walls are adorned with more than 1300 precious stones and beautiful frescoes. St. Vitus Cathedral introduced a wealth of innovations in Gothic architecture and inspired the design of many great structures around Europe, such as Strasbourg Cathedral, St. Stephen’s Cathedral in Vienna or countless less known buildings in Slovenia, Austria, Germany, Czechia. 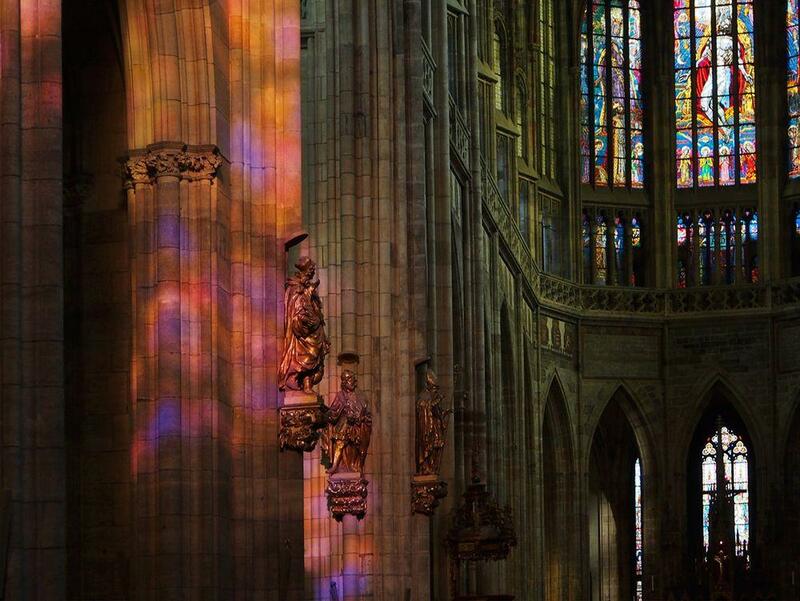 Very special is the play of light through the colourful stained glass of the cathedral. The high position of the cathedral above the surroundig city helps in this: sunlight reaches the windows unhindered. Thus, when Sun is shining – use the opportunity to see a sight of unbelievable beauty – one of the world’s greatest Gothic interiors illuminated by the light of all colors! The heritage of Czechia is very diverse and especially rich and diverse is man made heritage – from archaeological landmarks to the achievements of modern architecture. Among the numerous amazing landmarks the most interesting here are historical cities and towns, castles and churches. St Vitus Cathedral at Prague Castle is one of the symbols of the Czech statehood; it is the coronation and burial site of Bohemian kings and to this day is a leading Christian cathedral, a residence of archbishops, the venue for state ceremonies and, last but not least, a much sought-after tourist attraction.